Published on 24 August 2008. Week eight of Summer Books brings the second and (I promise) final collection of Guardian columns, and the only book by the most prolific author of them all – the much maligned Anonymous. This week’s selection is Living with Teenagers. When the Guardian relaunched in its Berliner format, a number of new sections were added to the Saturday edition. One of these was the slightly ill-conceived Family section, and therein lay the Living with Teenagers column, a weekly anonymous diatribe on the difficulty and horrors of family life in bourgeois England. Specifically, predictably, bohemian London. This book, as the collected edition of these columns, is possibly the least self-aware volume I’ve ever read. The writing is less self-aware than mine, and I take some beating in those stakes. And yet, that’s not a criticism; In fact, it’s what makes the whole thing work. 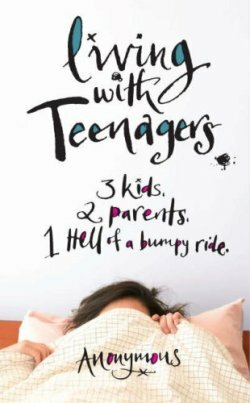 This is the story of a thoroughly modern parent try, and hopelessly failing, to deal with her three teenagers’ behavioural abberations of varying scale. She suspects her kids are on drugs, she’s shocked when they’re unhappy at the prospect of spending two weeks in an isolated cottage, and terrified by bad academic grades. In essence, she views everything her children do with her own frame of reference, which is not only far removed from theirs, but sometimes appears to reside in an utterly different universe to the rest of us. Not only that, she views everything they get up to as a direct result of something she’s done at some point in their upbringing: A kind of social post hoc ergo propter hoc, with no more sense here than in a court of law. Yet the anonymous mother seems genuinely to struggle throughout to be fair and accurate in her reportage, despite being so wildly removed from that goal. And whilst lacking self-awareness in her writing, she is incredibly self-critical, and perceives that she has many flaws as a parent. Living with Teenagers warms the heart, in that the imperfect children and the imperfect parents rub along, and genuinely care for and love one another. Yet it’s also wonderfully, unintentionally, darkly comic, and more engaging than I ever expected. Unfortunately, the wonderful denouement to the series was published in The Guardian long after the book was released: The friends of one of the teenagers found out about the column, and it came to an abrupt end – with Jack given the right of reply. If you prefer, you can read all of the Living with Teenagers columns online, but nothing’s quite the same as settling down with something akin to a diary, and becoming fully imersed in the world of the anonymous author and her family – you’ll want to intervene in the slow motion car crashes within, you’ll be frustrated at the mother’s inability to keep firm on even a single issue, and you’ll laugh out loud again and again, but I’m certain that you’ll feel a renewed sense of the good of humanity. This 1,367th post was filed under: Summer Books, Books, Gazette Columns, The Guardian.